The technical achievements of Elmer A. Sperry made him one of the most prolific and capable inventors in American history. 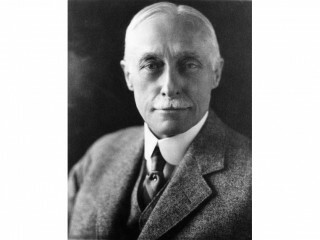 Like other successful inventors, he knew how to mix finance, engineering, and management to develop unique inventions into commercial products. Born on October 21, 1860, Elmer Sperry grew up near the small town of Cortland, New York. His mother died a few hours after his birth, and he was raised in a devout Baptist home by an aunt and his grandparents. Sperry showed a natural aptitude and interest in mechanical things during his youth. While in high school Sperry did well in science and drawing. The drawing skills would prove important in his later years as he visualized and communicated to others his many inventions. Sperry constantly read in the technical library of the local Young Men's Christian Association (YMCA), and during a YMCA-sponsored trip to the 1876 Centennial Exposition in Philadelphia he was exposed to the inventions and technical achievements of booming America. At the age of 19 Sperry invented an electrical regulator, part of an electric light circuit. Helped by the Cortland Wagon Company, which had a strong engineering department, Sperry acquired the tools, supplies, assistants, legal assistance, and other institutional support he needed to develop his invention into a complete arc light system. He moved to Chicago and, backed by money from hometown Cortland and from investors in Chicago whom he met through the Baptist community, he started selling his system there. Although Sperry's system was technically capable, it could not compete with its better-financed and better-run competitors. His company failed after about five years. But the particular needs of arc light systems had forced him to learn about automatic controls and feedback systems, on which he spent much of his future career. Through his wife, the former Zula Goodman of Chicago, Sperry had access to many people with money to invest and positions of power and influence. A good speaker, a charming person, and an enthusiastic booster of his projects—in addition to being technically gifted— Sperry had acquired the skills he needed for a consistently successful career. To avoid the routine, day-to-day engineering required by his first company, Sperry created a new company devoted to research and development. The new company let Sperry do what he did best: finding new ideas, directing the building of working models, and looking for problems that his inventions could solve. Sperry deliberately avoided manufacturing, selling to other companies the production rights to his inventions. For the next 20 years, Sperry entered a series of new fields just as they began rapid development. He chose fields that were attracting lots of financial investors, which provided the money needed for his inventive activity. He worked in the fields of electric light and power, mining machinery, electric traction (streetcars), automobiles, batteries, and industrial chemistry. Before inventing, Sperry always carefully analyzed earlier work to identify critical problems and to find existing inventions to which he could add his own expertise. Sperry concentrated on electrically-based inventions, such as electrical machinery and electrochemistry. In each field, he tried to solve critical problems that were holding it back. In 1907 Sperry became interested in using gyroscopes to provide stability to moving vehicles. Other inventors had designed "gyrostabilizers" that could help ships avoid the rolling caused by waves and wind. If you try to tip a spinning gyroscope, it will turn to one side in a predictable way—called "precession." In the same way, the force of a spinning gyrostabilizer pushed a rolling ship in the opposite direction from the push of the waves. Sperry invented a motion sensor, a motor to amplify the effect of the sensor on the gyroscope, and an automatic feedback and control system. All worked together to make a much more effective gyrostabilizer. Because he had analyzed the market for gyrostabilizers, Sperry was able to put himself in the right place at the right time. The U.S. Navy was building new, mammoth battleships that would be unusable without some form of sophisticated stabilizer. The Navy provided critical development support for Sperry, including the men, materials, and money needed to build models and experiment with ever-larger gyros. Navy support replaced the private financial investment on which Sperry had relied in the past. In 1910 Sperry created a company to specialize in gyroscopes. Over the next 20 years Sperry and his company invented, among other things, a gyrocompass, a stabilizer for airplanes, gunfire control systems, and an automatic pilot for planes. Like so many of his earlier inventions, these often relied on automatic control and feedback systems. Although Sperry had become well-known in technical circles, World War I placed him high in the public's awareness and provided him with much material success. His inventions were used heavily by the British, Russian, German, and American navies. As the second most famous inventor in America (after Thomas Edison), he served on the Naval Consulting Board and directed some of its major projects. He won many international awards, helped create the American Institute of Electrical Engineers and the American Electro-Chemical Society, and was a leading member of many other professional organizations. During the final decade of Sperry's life he further developed many of the systems he had started during the World War I years, adapting them to peacetime uses (such as taking a searchlight invented for antiaircraft warfare and using it as a beacon for the new airmail service). Sperry did not invent in isolation, but tried to take existing devices and methods and apply them to new areas. This was one of the critical elements of his style as an inventor and researcher. By the time of his death in 1930, Sperry met regularly with Rockefellers, presidents, ambassadors, and others. His biographer has called him "the father of automatic feedback and control systems." View the full website biography of Elmer A. Sperry.